If you have never heard of gyotaku don't worry neither did I up until my husband suggested we try doing it with our kids. Since we live in Florida "The fishing capital of the world" I have seen these prints many times in different places. Gyo means fish and Taku means impression in Japanese. It is the ancient Japanese art of painting fish to preserve their measurements dating back as far as 1862. My husband is an avid fisherman, in fact he was fishing this morning. The kids and I were with him and all of us caught a fish! I was starting to think that I might be a jinx because every time Josh has taken me out fishing I never catch anything... Arghhh...but I finally broke my bad fishing streak and hooked up to a big drum today. I was pretty stoked, to quote my husband. Since Josh and the boys are always catching fish for us to eat why not try making them into works of art before we enjoy their delicious filets? I have to say we were all really excited with the results. I am even going to get some frames to hang them up in our living room and the boys room. I have drawn the line with taxidermied deer on my wall but these are really cool looking. We made prints of a snapper, hogfish, lookdown, lionfish, and black drum and barracuda. 1. Catch your fish or borrow one from a fisherman friend. 2. Dry really well with towels. 3. Lay fish on cardboard. 4. Place foam under fins. 5. Pin fins to foam. 6. Paint lightly with india ink/ you might need to add some water to the paint so it doesn't cover it too thickly. Don't paint the eye. 7. Place rice paper on fish gently. 8. Smooth paper over fish, making sure to get all of the fish print on to the paper. 10. Fill in details with paint, coloring as desired. 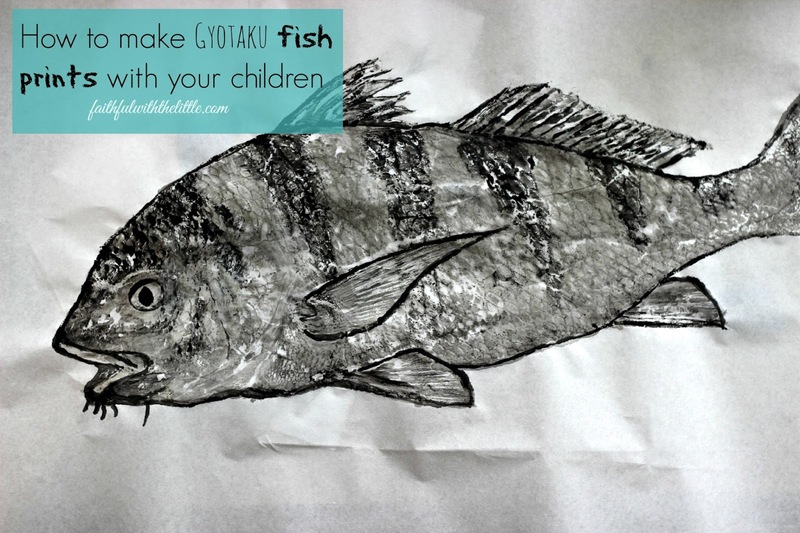 If you are looking for a new art project to do this summer try doing gyotaku prints with your kids. Not only can you still eat the fish after printing them but the prints capture such a lifelike replica of your trophy fish that you can't get with a picture. I am so thankful that my kids get the opportunity to fish with their dad and learn about all the cool sea creatures that live in our local waters. Since we are still doing school during the summer I am chalking this up as their science and art lesson for the week! Do you have any fisherman in your family? Have you done gyotaku fish prints before? Disclosure: Links on this post contain affiliate links. Great! I hope you get to try it!